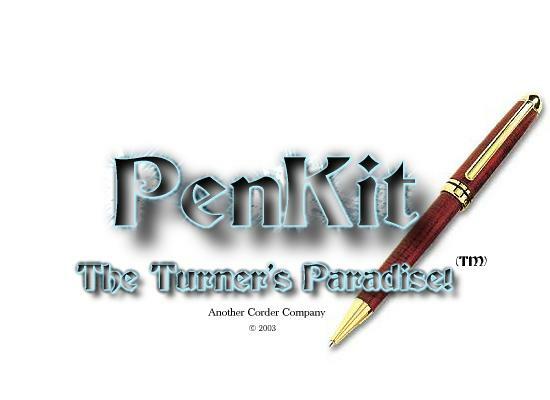 Making Wooden Pens and Pencils using PenKit mandrels, wood blanks, and other hardware and finishing accessories. Wholesale Wood / Pen Supplies! If you already own a lathe, skip to the next step. If not, you'll need to decide which lathe is right for you. Step 2 - Find a mandrel to fit your lathe's headstock. The mandrel allows mounting the pen tubes and wood to the lathe for turning. Our pencrafting system allows any of our kits (regardless of tube diameter) to be made on the same mandrel. Choose from PenKit's wide selection of precision mandrels. Step 3 - Choose any pencrafting project kit you like. For example, a typical pen kit will include: brass tubes, a pen refill, a 24 kt. clip, band and cap, and a twist mechanism that extends and retracts the refill. Our huge variety of kits include all of the metal components (usually 24 kt gold) used in making your pencrafting project. Warning: You should always use Pen Kits and Bushings from the same supplier. Step 4 - The beauty of pen making is in the wood. Use our convenient wood blanks, your own shop discards, or found wood. We carry standard, exotic, and rare woods as well as colorful acrylic blanks. Step 5 - Use the appropriate bushings and drill bit. They indicate the final diameter of the wood on the pen tubes, and they make it easy to mount tubes onto your mandrel. You'll also need to drill the wood so it can accept the kits brass tube(s). The correct bushings and drill bits are identified with each pencrafting kit on our web site. Step 6 - Finish the job with panache -- and polish. Bring your pencrafting project to a dramatic conclusion with our many outstanding abrasives, lacquers, waxes and polishes. Present your project in one of our many display or boxes and smile as you gracefully accept the compliments. Our hardware accessories and supplies will make pencrafting even easier. Choose from clamps, drill guides, lathe chisels, and more.